Amalfi “Quatro” Dining Table Crafted in Belgium. Suitable for Full Outdoor Weather Use Featuring a Durable High Grade Aluminium Base with a Charcoal Powder Coated Finish. 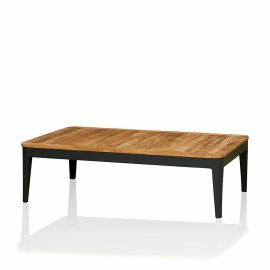 A Statement Base with a Distinctive Silhouette Paired with a Premium A Grade Teak Tabletop. Thick Top Planks with Rustic Lines Offering a Product of Exceptional Strength & Durability.